Have you ever wondered what it's like to taste a piece of art? Experience how masters of food interpret masters of art at Art Bites, a night of masterpieces both visionary and delicious. Top Austin chefs will be paired with works of art from the Russell Collection to form wonderful mouthfuls that are interpretations of art itself. Beverages will be provided by Old Forester and tunes by DJ Phamstar. Purchase your tickets now and take a look at the culinary lineup for the night. A portion of ticket proceeds and five percent of art sales will go to the Austin Food and Wine Alliance. 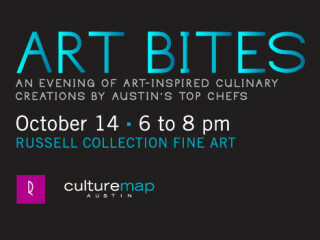 The evening is sponsored by the Russell Collection Fine Art, Cadillac and CultureMap Austin.